Okay, I confess. When I decided that we'd make spaetzle for the current Monday Mouthful challenge with ChefE over at Cook Appeal, I already had a dish in mind. One of my favorite restaurants in Strasbourg is La Corde à Linge, which specializes in spaetzle dishes (although I've already mentioned it here before regarding their delicious desserts). Usually, spaetzle is considered a side dish, but at La Corde à Linge, it becomes the main attractions. All of their dishes start with either the traditional spaetzle (which is what this recipe is based on) or a potato version, paired with a meat or veggies, and some sort of finger-licking sauce. 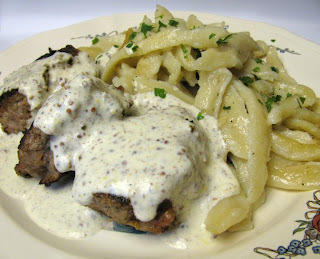 One of my favorites is the meatball and mustard cream sauce spaetzle--the dish I tried to recreate. I don't often cook without a recipe at all (although I often deviate from the ones I do use), and so this was a real challenge for me, trying to recreate a restaurant dish. And it was successful! I think I hit the mustard cream sauce almost exactly, and the meatballs were close, but I still have a little work to do on those. 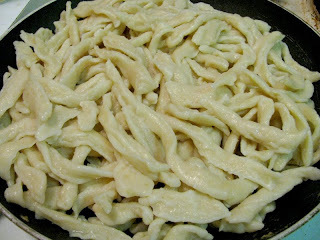 The spaetzle turned out tender and flavorful...and they were surprisingly easy to make, if a little time consuming. You can find the recipe here, but I documented some of the steps below for those of you who may be a little reticent to try making your own noodles. Before starting, put a pot of water on to boil. 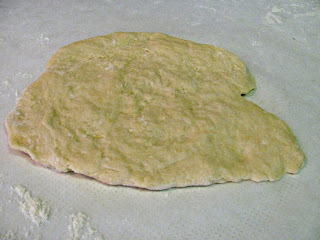 After making the dough (to which I had to add a little more water than called for, but only took about five minutes to throw together), break a small piece off (about a quarter of the dough) and smash it flat with your hands to about 1/4-1/2" thickness. It doesn't matter if it's round--you'll just be cutting pieces off of it. 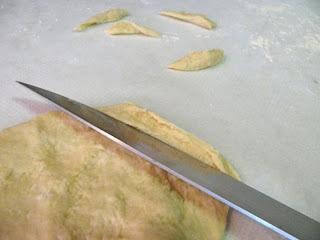 With a sharp knife, scrape pieces off of the dough. You can make them any size you want...I stayed rustic and made them in whatever size came off of the knife. 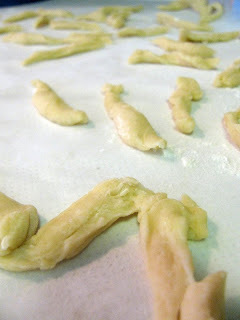 I scraped them off in batches because you shouldn't have more than one layer in the boiling water at a time. I found that the spaetzle was ready in about five minutes. So, while one batch was boiling, I'd scrape off the next batch. I set up a colander over a paper towel, and used a slotted spoon to remove the cooked spaetzle from the water to the colander. I drizzled just the tiniest bit of olive oil over the noodles, and mix them up with each batch I added to keep them from sticking together. After boiling them all, I fried them in some butter and pepper. My frying stage was the least successful since I tried to fry them at high heat at first, but it turns out that they fry better at a gentle heat. Bring cream to a boil in a saucepan. Reduce heat, and cook, whisking often, 10 minutes. Whisk in wine , mustard, and pepper, and cook until thoroughly heated. Now that I am in the mood, and it came off so well...I am making yours for my bi-weekly ground beef dinner! I loved recreating this dish I learned in culinary school! I love the mustard cream sauce you used. Sounds perfect for the spaetzle. Have fun in Zurich. Haven't been there in years. We spent a New Years Eve there once and all of the bells throughout the city rang to welcome in the new year. Beautiful experience and one we won't forget. Drank champagne on the street in front of a fancy department store out of a crystal glass (not a cheap plastic one.) I was impressed. Have a safe trip and tell us all about it when you return. Looks delicious! Have a wonderful vacation! Wow! 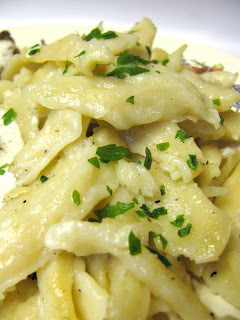 Your spaetzle are perfect and that mustard cream sauce looks fabulous (I want this dish for dinner). So perfect! I want to try your spaetzle recipe but went out of town. I may just try it anyway! So excited to see this! I have to try making it. Yours looks great! How you made the "Spaetzle" reminds me of one famous Chinese noodle dish " Dao Xiao Mian " literally translated as "Knife-shaved Noodles". The chef holds a large dough ball in one hand at the shoulder height, and a knife with another hand, then noodle shaving should fly into the boiling pot to cook. In China, we call those chef "Meister" "Artist" . It's amazing to wait aside and see how they make your noodles. None of shavings is identical, and they chewy texture. The whole shaving performance makes the whole dining experience unforgettable. Looks delicious, Mindy! Sounds like your spaetzle making adventures paid off!